D.J. 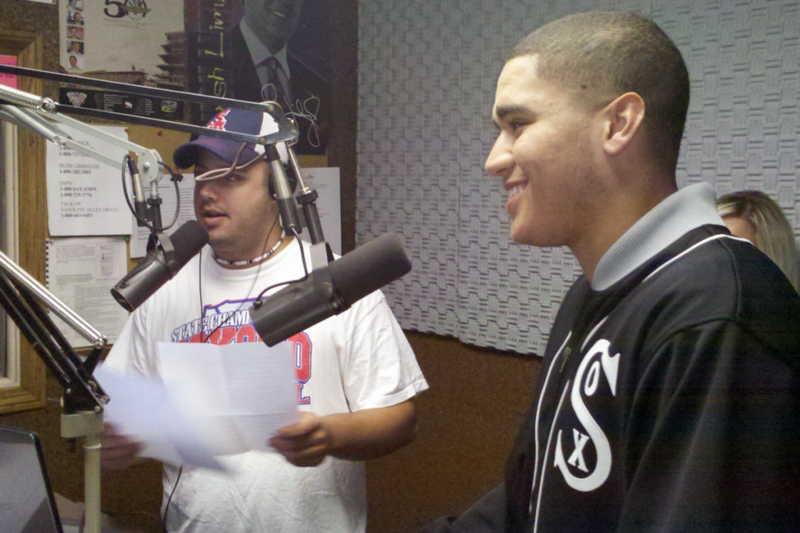 Balentine makes his college choice known live on WIOU Sports Director Chris Lowry’s Monday afternoon sports talk show. Kokomo High School basketball standout D.J. Balentine has finally answered one of the biggest sports questions in recent Wildkat history: Where is D.J. going to college? On Monday night, the Indiana Junior All-Star announced he would join the NCAA Division I program at the University of Evansville. The new Purple Ace said he had a major choice to make as 10 schools offered him a scholarship. He then narrowed that list to Evansville, Indiana State and Missouri State before choosing the southern Indiana college. Balentine said one of the reasons for his choice was the proximity of the school to Kokomo – his parents, Joy and Dennis, attend all of his games. He also cited a coaching staff that made him feel welcome as soon as he stepped onto the campus. But one of the major factors may have been putting on a hard hat and touring the new $140 million, 11,000-seat Ford Center that is scheduled to open later this year. Balentine will join a Missouri Valley Conference program steeped in basketball history as the Purple Aces won the NCAA Division II national championship five times. They moved up to the Division I level in 1977 and have appeared in five NCAA tournaments. Balentine will play basketball for head coach Marty Simmons, who took over the program in 2007. Under Simmons, the Purple Aces have built a hefty pre-conference schedule that has included Indiana, Butler and North Carolina. Balentine has put up some gaudy numbers in his first three seasons of wearing the Red and Blue. After scoring 45 points his freshman season, the shooting guard exploded on the Hoosier Hysteria scene with 366 points as a sophomore and added another 413 points last year during Kokomo’s Class 4A state runners-up campaign. With 824 points thus far in his career, Balentine has a chance to become Kokomo’s first 1,200 point scorer since Tim McFarland in 1976. He could also become the 11th member of the Wildkat 1,000 Point Club and just third since 1977 (Brad Sebree joined in 1990 and Brandon Wood in 2007). Before he dons the purple, white and orange of Evansville, he has unfinished business in Kokomo. The senior sharpshooter has made it no secret that he wants to lead coach Brian McCauley’s Wildkats back to Conseco Fieldhouse so the Kats can exchange the red runners-up rings for blue championship ones. That quest begins against Western on Nov. 23. This entry was posted in Balentine, Basketball, Evansville, High School, Kokomo, Wildkats. Bookmark the permalink.